“How can a blog provide real business value?” This is a question we’ve heard a lot over the years from apprehensive marketers – and strong calls to action that engage readers are one solution. Quality content is the first step to a successful blog. But once you have your readers’ attention with words and images, urging them to continue down the buyers’ path is your ticket to monetary success. Brand awareness and blog engagement are critical, but conversions will have the most immediate impact on the bottom line. 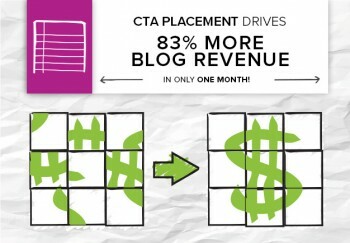 A design refresh correlated with a decrease in blog conversions. CTA buttons for relevant product pages had previously occupied the top right hand corner of the blog, but were moved to the bottom of the page. Build a content archive around the company’s top products, with CTA buttons that related specifically to the products mentioned within the blog posts. Bring in a UX mockup to test optimal placement. Updating article templates for CTA buttons increased revenue in one month by 83 percent, despite a traffic increase of only 1 percent. This was across channels – organic search saw a 431 percent increase, email referral traffic had a 300 percent increase. Placement: Google research shows the best place for a CTA button is “above the fold” of a page, but closer to the bottom than the top of this area. Many brands fall into the trap of putting essential elements front-and-center in their layouts, but it seems that they’re better off after text but before scrolling is necessary for them to be seen. Use first person. When you utilize first person, you’re thinking from the reader’s perspective, not the marketer’s. “Download my guide,” for example, is more effective than “Download your guide.” Don’t take my word for it: One study said first person CTAs can boost conversion rates up to 90 percent.